Mix the dressing ingredients together until well blended. Prepare Pecan Chicken according to package directions. Let the chicken cool slightly after cooking. Cut the chicken breast in half, lengthwise, then cut the chicken into strips. Place the chopped greens on a salad plate. Mix together the following ingredients – tomatoes, cooked couscous, corn and craisins. Place this mixture on top of the greens in the center of the plate. Place the cut chicken pieces on the greens toward the edges of the plate. 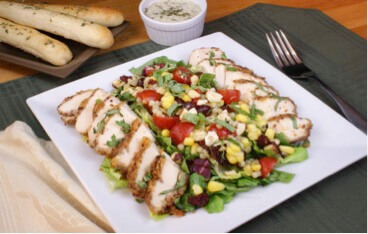 Serve with Basil Pesto Ranch Dressing.